A team consisting of HKS Architects, Safdie Rabines Architects, and landscape architects OJB was recently selected by the University of California, San Diego to design the university’s new Living and Learning Neighborhood at North Torrey Pines, a forthcoming campus expansion modeled after traditional mixed-use urban forms. 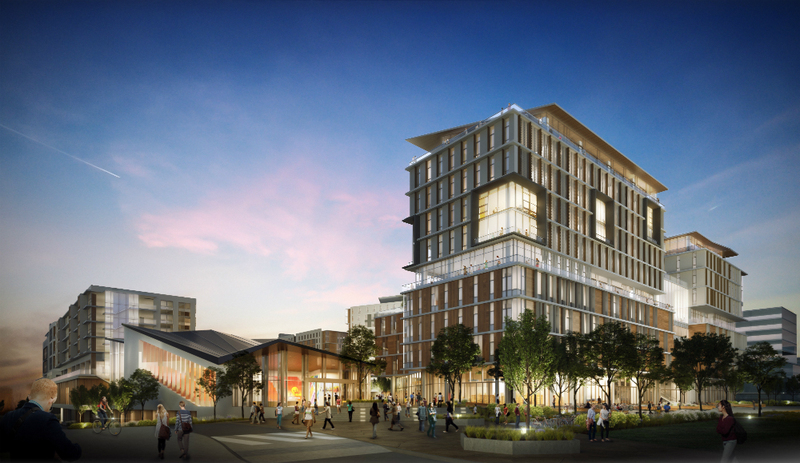 The project will provide housing for 2,000 undergraduate students as well as new educational spaces and administrative offices, among other uses. The campus extension will consist of seven new structures ranging between two and ten stories in height. Those new buildings, according to renderings released for the project, will feature blocky, articulated massing with various building geometries clad in traditional materials, including brick and wood panels. A pair of the structures will be 10-stories tall and joined at the midsection by a series of multi-level skybridges. Other structures will be composed of similarly hybridized masses, with traditional housing blocks stacked above office and educational podium structures. The buildings feature a relatively high ratio of exterior glazing, with large swaths of glass curtain walls and punched openings populating each expanse. The buildings will also feature multi-story cutouts and loggia spaces along their facades. Lorcan O’Herlihy Architects, SOM, Kevin Daly Architects, and Kieran Timberlake are currently at work on a multi-phase housing expansion at California State University, Santa Barbara while Chicago-based Studio Gang Architects are working to overhaul and expand the Moore Turnbull Page-designed Kresge College housing complex at University of California, Santa Cruz. University of California, Davis is also planning a large-scale campus expansion. 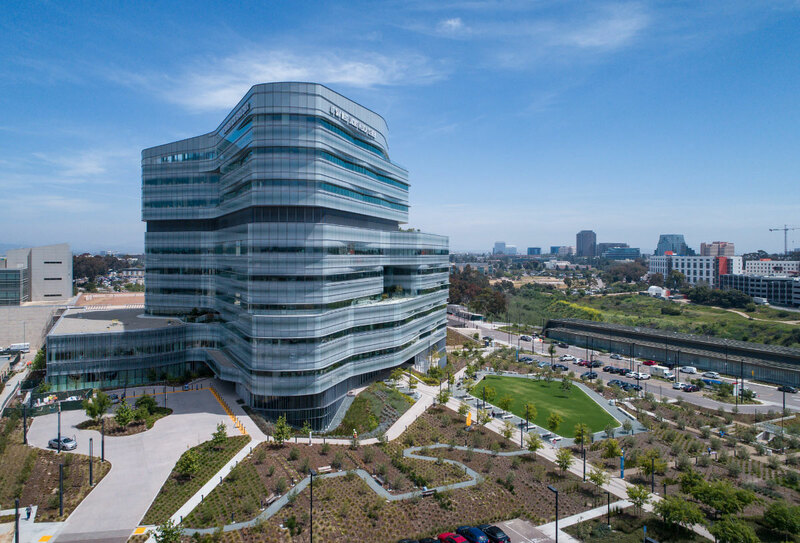 The project at UC San Diego is currently preparing to enter construction this summer and is expected to be completed sometime in 2020. Is That A House On Top Of Your Building? 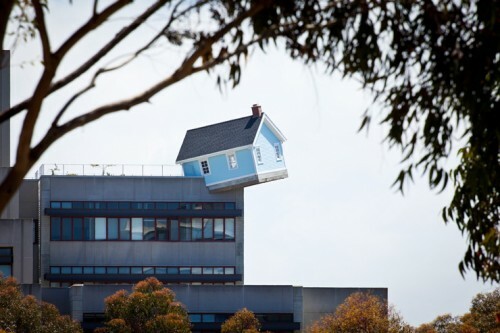 At first glance, visitors might think that the house from Disney’s Up managed to crash land atop UC San Diego’s Jacobs School of Engineering building. What they’re actually staring at, however, is Korean artist Do Ho Suh’s latest installation, Fallen Star, a 15-by-18-foot New England cottage suspended off the edge of the seven-story Jacobs building at a disconcerting 10-degree tilt from the building’s flat roof. Suh said that the installation recalls his own experience of moving to the U.S. to study at the Rhode Island School of Design. He felt “as if he was dropped from the sky.” Opened to the public on June 7th, seven years after the artist’s initial sketch, the home has a garden, plum trees, wisteria vines, tomatoes, and more. Inside, the white-trimmed blue cottage (its interior floor set on a gentler five degree tilt) is furnished with a living room set, bookcase, and even a chimney that blows off steam to simulate smoke. Picture frames display baby pictures of former Jacobs School of Engineering deans. Except for the chandelier, which hangs plumb due to gravity, everything is slightly askew, just as the artist envisioned. Fallen Star was built in the Fall of 2011 and hoisted onto Jacobs Hall on November 15. Despite its unusual siting, the home didn't escape from building regulators' grasp. 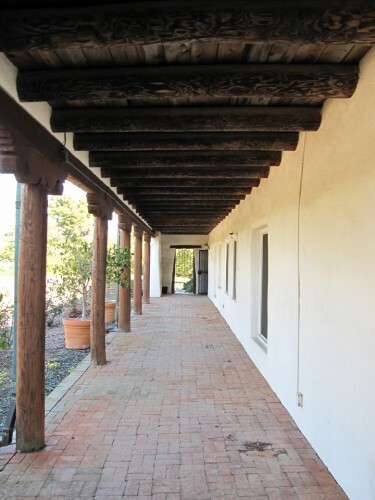 It adheres to California’s earthquake building codes and can withstand 100 mph winds. The project is the 18th installation of UCSD's Stuart Collection, which engages international artists to create site-specific work on campus. The $1.3 million budget for the project came from private donations except for a $90,000 National Endowment for the Arts grant. Fallen Star is open to the public Tuesdays and Thursdays from 11:00 a.m. to 2:00 p.m. The University of California Board of Regents yesterday approved the second phase of the rehabilitation of UC San Diego’s University House. Located on seven acres in La Jolla Farms, the eccentric 1952 structure was designed by noted Santa Fe architect William Lumpkins. It has been closed since 2004 when it was pronounced uninhabitable because of seismic and system deficiencies. Here's the best part: the house will be renamed the Audrey Geisel University House, in honor of the widow of author Theodor ‘Dr. Seuss’ Geisel, a longtime philanthropic supporter of the campus. Mrs. Geisel has donated more than 8,000 of her husband’s original drawings, sketches, books, and other memorabilia to the university libraries and donated more than $20 million to UCSD. The entire cost of the Geisel House renovation, estimated at $10.5 million, will be covered by gift funds including $1.5 million gifted from the UC Office of the President.